A pioneer of underground culture, Basquiat created his own genre of art through a rich fusion of words, images and collages. An intimate companion of Andy Warhol, Basquiat’s work has a certain sensitivity which often reflects a childhood memory or serves as a social commentary. His piece entitled Skull is poignant in both its complexity and message, and its deeper meaning is still the topic of much debate. The art world has been breaking down, analysing and obsessing over Basquiat’s work for years. New York galleries began hailing the artist as a prodigy even before his twentieth birthday. A key player in the emerging New York underground scene, his influence shook up the post-expressionism movement of the 1980’s. Brooklyn-born Basquiat was of Puerto Rican and Haitian descent. From a very early age he exhibited a strong affinity for the arts. At the age of seven, he was struck by a car, and was hospitalised. In order to keep him entertained, his mother brought him a copy of the renowned medical manual, Gray’s Anatomy. By pouring over the medical images and dichotomy illustrations in the manual, Basquiat nurtured inspiration for some of the most iconic and celebrated works in contemporary art. Though brief, Basquiat’s life was nothing short of eccentric. His brilliant mix of graffiti, text and iconography pierced the art scene with audacity and intelligence. Not making it to his 28th birthday, Basquiat passed away in a New York studio, surrounded by his life’s passion: art. He left behind more than 800 paintings, 1,500 drawings and perhaps the most recognisable artistic thumbprint of the 20th century. Skull, the renowned work produced in 1981 was originally named Untitled, like many of Basquiat’s paintings and drawings. One may surmise that the artist is exploring the internal/external dichotomy of the human skull: underneath its rather simple appearance lies a complex mass of material that determines the very nature of the human condition. Basquiat uses multiple techniques to present his subject in a variety of states. Acrylic paint serves as a base layer and the scrawled lines in coloured pencil add an element of texture. There is a visual contradiction occurring between the skinless jaw, exposed teeth and the fleshy eyelids, eye balls, ears, nose and hair. 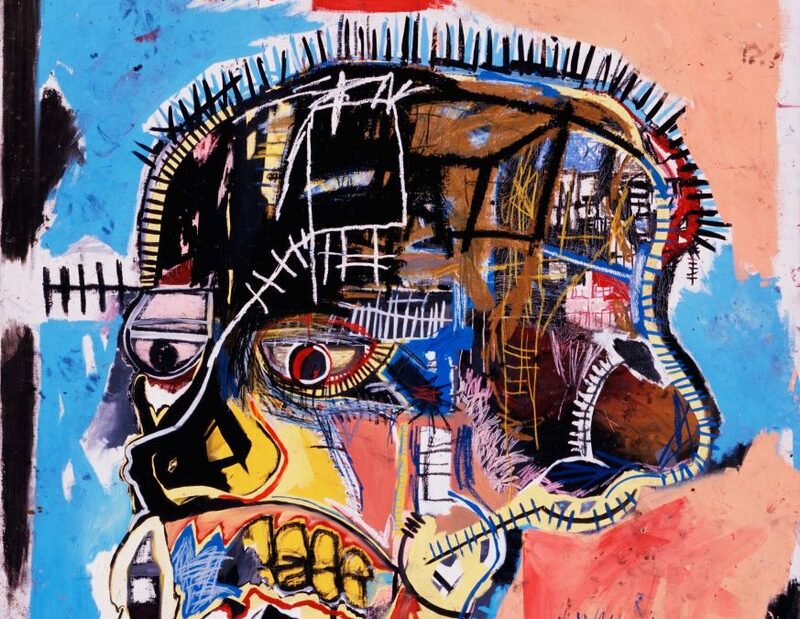 Emitting a chaotic energy that inevitably draws the viewer in, Basquiat urges us to marvel at the physical union of jumbled parts. As with many of his works, Basquiat staged himself in self-portraits that, at first glance, may seem to lack realism. Rather, he compels us to recognise his signature style in his work rather than a life-like representation. 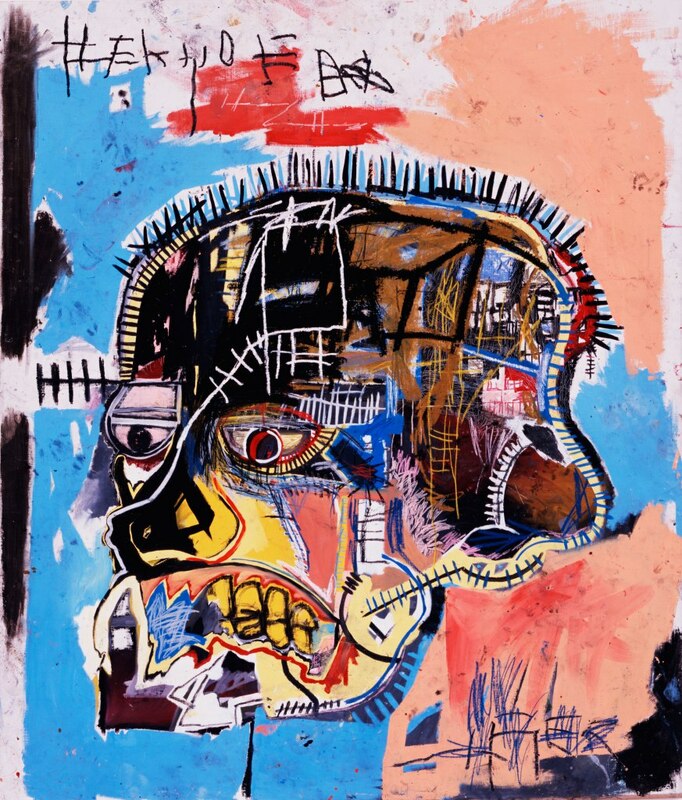 As the skin colour on the right side of the head is black, the painting could very well be referring to Basquiat himself. But what is the deeper meaning here? Perhaps he’s exploring themes of darkness as applied to social politics? Or is it a reference to the afterlife? Maybe he was conducting a study on the anatomy of his being? If it is indeed a self-portrait, what does this reveal about his worldview? Many believe he’s evoking the subject of race and is seeking to manifest the struggle of the black man in America through his art. No matter the interpretation, there is something to be said of this painting which was completed at 20 years of age, the start of what would have been a promising career. 3. An ode to life or death? There is a noteworthy relationship between the vibrant pastel colours that frame the skull and the profoundly haunting tones and shapes that fill it. The gaze of the detached eyes reveals a certain sadness, eclipsed by despondency. The mouth is fashioned in a contemplative frown, the teeth and jagged and yellow, and every facial feature looks to be shoddily stitched together by coarse thread. His depiction is one of the internal physiology of a conscious, yet decomposing mind. This work contains many mysteries that we can only attempt to solve. When individually examining its aesthetic properties, one can understand its flow: there is total pandemonium in his mind, perhaps a reflexion of his psychological state. But is he already dead when experiencing this? Or is this the process of dying? We won’t ever be able to say for sure. His work has captivated us for decades as we continue on our quest to decipher the meaning behind the mayhem, which starts and ends with Jean-Michel Basquiat. Calling all Basquiat fans or those who want to learn more about his work, a retrospective was organized at the Louis Vuitton Foundation in Paris. Basquiat inspires many modern-day artists. 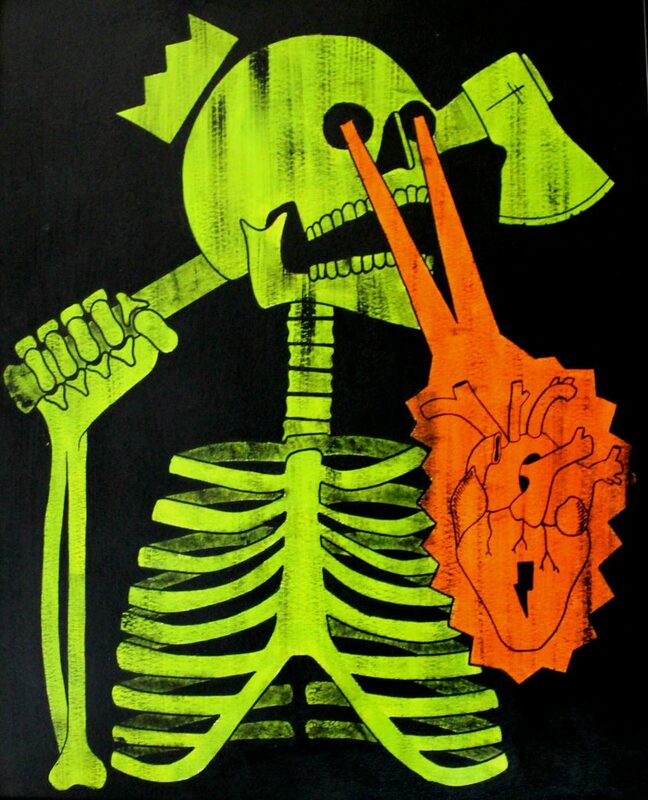 An example of such is Le Zoultar who celebrates Basquiat’s influence in his work Gray’s Anatomy through his use of a crown, skeleton, and eery allusions to death.